Frustrated with your cold calling results? I have the solution for you. I was also frustrated until I discovered what works. It was a sunny day in April when I was hired for my first sales job years ago. It was exciting . . .
. . . until I learned I would be required to make cold sales calls. A terrifying thought at the time. The first day I was scheduled to make pro-active cold phone calls, the manager sat next to me, listening to every word I spoke. I still remember the feeling of butterflies in my stomach and sweaty palms while I was making the call. I wasn’t sure I would be able to speak. Somehow I made it through that first call. The fear of making outbound calls turned into confidence when I learned how to genuinely earn the trust of prospects who became loyal clients. What a relief! With practice and through trial and error, my confidence and sales increased and I became the manager of my department – a department that had a higher profit margin and better employee retention rate than any other department in the company during the time I managed the department.
. . . I developed a one-to-one sales training and coaching e-Course to help others who are going through what I went through years ago. This course has been very successful, as you can see when you read the testimonials. Learn how to create your own unique opening statement which will allow the customer to become more comfortable and will end up in more sales for you. Use authentic words that will cause the customer to trust you and feel that you are there to help her rather than “just get the sale”. Read more details about the course on this page. As your coach, sales trainer and adviser, my role is to guide you in gaining a clear understanding of how your strengths affect your results and help you feel more comfortable when reaching out to your prospects as you grow your business organically and productively. To find out more send me an email – I would love to hear from you! 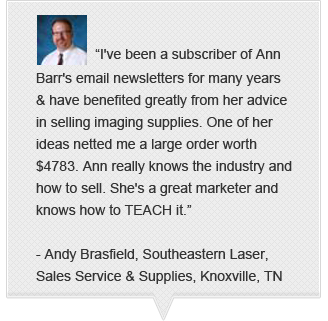 I’ve helped thousands of customer service and sales people in the U.S. and Canada gain more trust in the eyes of their prospects and increase sales. I love helping new customer service and sales reps through the process of making pro-active outbound calls that produce positive results. I am passionate about working with experienced sales people who want to build trust and eliminate rejection during telesales calls. Does it work? 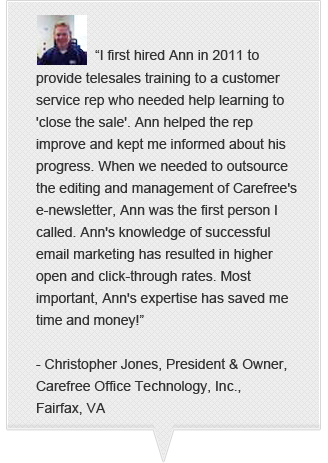 Read what clients say about working with me. You can find out what is included in this private one-to-one online 4-week e-course on this page. It can be frustrating and stressful to begin making phone calls to strangers, especially when we think we might be rejected. If you are experiencing rejection on your sales calls, you will learn that it’s probably not your fault. It might be the fault of the selling approach you are using. I like to call it “connecting with your future loyal clients” because . . .
. . . cold calling does not have to be a painful and frustrating experience. It can be a smart way to build credibility with future clients + increasing your sales and profits. Yes, really. Intelligently crafted opening statements let people know how you can help them without turning them off and making them want to reject you and hang up. I can help you create your own authentic opening statement. A well-developed introductory statement attracts interest and attention and gives you credibility – without making you feel sleazy. To find out if my coaching and training fits with your situation, send me an email and I’ll reply to you as soon as possible. I look forward to working with you!